Conference and Industry Workshops are a major investment for many. Often times, aside from the registration prices, you’ll have to account for airfare, accommodations and other miscellaneous items that may come up. It’s easy to shy away from attending one, especially with so many options. But consider the benefits that can come from attending one. In many industries, like medicine, law and education, continuing education is a requirement. In fact, your boss may require you to attend conference to enhance your skills or keep you up to date on industry benchmarks. The same standards that apply to other industries should also apply to yours. As an Entrepreneur, it’s up to you to refine your skills and keep up with business standards. Unfortunately, with the many hats you wear and the investment you’ve already put into your business, it’s easy to brush off attending a rewarding conference experience. Here are things to consider when determining if attending a conference will give you a good ROI. 1. Will you be able to build your network with like-minded professionals? Relationship building is crucial to increasing ROI. Many of the attendees will be traveling and investing in the conference just like you are, which presents a great opportunity to create authentic experiences. And there is an elevated perception of your brand because of the investment you have made, making for more meaningful and deep conversations. Aside from meaningful connections you’ll get, you’ll also up-level your reputation. As an attendee, the increased strength of your brand is directly proportional to the strength and reputation of the conference you are attending. Consider the visibility and reputation of the conference you are considering attending. 2. As an attendee, will you be able to generate new leads and opportunities? With the prominence of social media and tech-centered networking, in-person interactions are more important than ever. Attending a conference isn’t just about the education and networking, it’s about the business opportunities. Will you meet attendees that will also refer new business to you? It’s a matter of knowing who is attending and being mentally ready to impress them face-to-face. Make sure your target audience is attending the conference. Chances are, the referrals you’ll get from them will heavily increase your ROI. Internet based relations are the norm, but face-to-face interactions close deals. Action item: Make a list of key attendees you'd like to meet before you attend the conference and get ready to make time to deeply connect with them. 3. Are there actionable items being taught that you can immediately apply to your business? You should be able to gain at least 1 solid nugget that you can return home and implement into your business, that will in turn generate more revenue or visibility for your brand. That can come in many forms, from a motivational boost to get your out of an entrepreneurial slump, to a marketing trick that will help you increase your marketing goals, to a technical skill you can use to create a more refined product. Action item: Whatever the goal is, make sure you clearly understand it before heading to the conference. 4. Will I be able to engage with the speakers? Conference give you an opportunity to hear from speakers that are otherwise not reachable. Before attending a conference, determine if the speakers are those that will inspire you and/or help you reach your business goals. In addition, consider if you will be able to engage with the speakers. When you are able to truly connect with speakers and have one-on-one or intimate group time, you are presented with even greater opportunities. At our conference, we create an intimate environment where you're able to build a true connection with speakers. We've even had some speakers refer business to previous attendees! Action item: Study the agenda and speaker topics and have your questions ready. 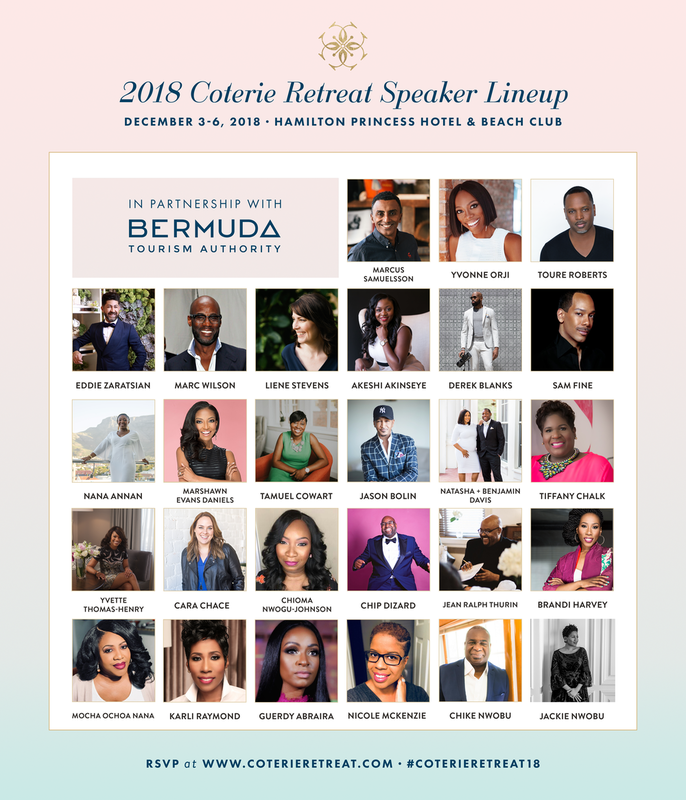 Take a look at the Coterie Retreat lineup and start writing down your goals for the experience. We look forward to welcoming you to Bermuda this December. Our Keynote Speaker is Revealed!